Some people escape the demands of their jobs by taking a vacation to a tropical resort or enjoying downtime at home. Jake Tapper does it by creating more work for himself. The Philadelphia native has emerged in recent years as one of the most respected journalists in the country, and his is the voice that many Americans turn to for a calming influence during these unpredictable times. Whether he is moderating a presidential debate or covering a school shooting, the anchor and chief Washington correspondent for CNN is known for delivering his takes with aplomb and dignity. 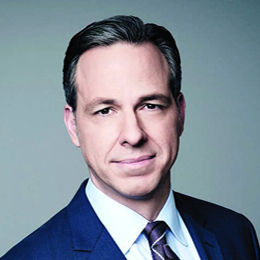 While he is most recognized for his television work, however, Tapper actually broke into journalism on the print side in newspapers and magazines. He has also embarked on a second career as the author of several books, including The Outpost: An Untold Story of American Valor, a renowned account of one of America’s deadliest battles during the war in Afghanistan. Tapper’s latest effort is The Hellfire Club, his first foray into fiction. Set during the McCarthy era in 1950s Washington, D.C., the political thriller tells the tale of former war hero Charlie Marder, a young congressman, and his wife Margaret, a zoologist. As Marder delves into politics while trying to remain true to his principles, he interacts with real-life figures like Joe McCarthy and the Kennedys and eventually risks his life trying to get to the bottom of a governmental conspiracy. South Jersey Magazine recently spoke to Tapper about the origins of his first novel and why the research and writing of the book were a welcome diversion from his regular gig. He also shared his thoughts on his beloved Philadelphia Eagles winning their first Super Bowl in February. With everything you have going on in your career, is it important to you to find time for writing? Yeah. It was a great escape for me to write. I’ve been working on the book for several years and I found it was a very therapeutic way to deal with how insane the media environment is and how insanely busy my schedule is in general. Your other books have been more about telling other people’s stories. Have you aspired to write a novel? I went to film school after college and I’ve always been a big reader and consumer of fiction. There were a few things I read about that were historical events that I kind of brainstormed and thought would make a good novel. There are a number of actual events that took place in early 1954, one after another, [and it’s] kind of astounding that they all took place at the same time, both in terms of Joe McCarthy being at his height of power and also about to be taken down, the terrorist attack on the U.S. Congress, the comic book hearings and any number of other political events going on. That, combined with some other historical things I read about made me think it would be an interesting way to capture some feelings and observations that I have about Washington, D.C., that hold true today and held true in 1954. So the book to me is about the swamp, it’s about abuse of power, it’s about demagoguery, it’s about how much people are willing to compromise to achieve what they want to achieve. Those themes are as true today as they were back then. The main point with Charlie for me was to have a character that was likeable and represented kind of what America was in that period. He was a good person, he had gone to war. But he also needed to be somebody who was weak and naïve enough in ways to make these compromises. I cover these people all the time in Washington who make compromises, and what’s interesting to me is that they all come to Washington to do good, to be good people and help make society better. Then they get in over their head or something happens. So what’s interesting to me is, how do people end up on this road to compromise? For Charlie, it’s little by little. He’s asked to do this, he’s asked to do that. He wants to help soldiers by stopping this one company get federal money because they made bad gas masks during World War II, and in order to achieve that he’s told he needs to do this or do that. All of the sudden he’s up to his neck in the swamp and he doesn’t even realize it, he’s just been trying to do good. Has the decade of the 1950s always been a time period that intrigued you? Absolutely. I feel like the 1950s doesn’t get as much attention as it should because it’s sandwiched between World War II and the 1960s, which obviously were a momentous time of upheaval. But the ’50s were a really fascinating time with the Red Scare and McCarthyism and a huge economic boom. People think of them as a quaint and innocent time, but they’re not. There was a lot of really shady stuff going on; both communists and people fighting communists were doing shady things. It’s really quite a time of menace with this very attractive veneer on it; a very scary time. Did you enjoy writing about iconic figures like the Kennedys and McCarthy? That was part of the fun, having people from that era interact with my fictitious characters. Having Roy Cohn get into a fight with Charlie, my main character. Or having McCarthy give him advice. Or having he and Margaret wander into a restaurant in Georgetown and run into Jack and Jackie Kennedy and Robert and Ethel Kennedy. That was a joy. I tried to read a lot about them so I could be true to who they were. Is it true that Bobby Kennedy’s close friends knew him as Bob? As you said earlier, there are some parallels to be drawn between that time period and the current one. What is it like for you to cover the news during this tumultuous time? It’s exciting, it’s exhausting, it’s everything. I never know what’s going to happen. There are 15 news cycles an hour sometimes— that’s what it feels like. Is journalism still a noble calling? Yes. Now more than ever I think it’s important that [journalists] rise to this moment.While we’re under attack, it’s important that we cross our t’s and dot our i’s and make sure we’re doing it right. The public needs us; there’s very little oversight of the executive branch being done by the legislative branch. We need to be doing that job. I know there have been issues and problems and some stories have been wrong, but for the most part I think the media is doing a vital job. How did growing up in Philadelphia shape you and your approach to your career? I think one of the things is it made me very appreciative of American history, just being bombarded with Americana during the 1970s and the bicentennial. That was a big part of it, and I also think there’s something about being in Philly that makes people challenge authority. We feel like the underdog and we kind of have a chip on our shoulder. That chip has been helpful for me as a journalist. You have an upcoming event at The Free Library of Philadelphia to promote the book. Do you have any spots you try to visit when you are back in town? We actually have two events.We have one at the Philadelphia Library and one at Drexel at the end of May. If I can I usually try to sneak in a breakfast at the Melrose. That’s about it; maybe a cheesesteak run to Tony Luke’s or Geno’s or Jim’s. It really depends on the timing. How often did you make it over to South Jersey growing up? I would go to the Shore sometimes: Ventnor, Margate. One of my friends had a place in Loveladies in LBI, and we spent some time in Wildwood too. I also had a lot of friends in Cherry Hill growing up, so I’d be there all the time. We hit the diners in South Jersey all the time in high school. Let’s talk about the Eagles. First of all, were you the kind of Philly fan who never thought you would see the Eagles win a Super Bowl, or were you optimistic? I never thought it would come. I rooted all the time for the Eagles, but it had never happened in my lifetime and it was tough to imagine. It’s pretty incredible to me that it did. You were able to attend the NFC Championship Game and the Super Bowl in person. What were those experiences like? The Eagles invited me to the Championship Game and my boss got me tickets to the Super Bowl, and it was incredible. It’s all a blur. I wish I could go back and do it all again, because I was so nervous during the Super Bowl that I forgot a lot of it. I remember the last few minutes very well. What I don’t remember is the middle of the game, but it was an incredible game. Getting back to The Hellfire Club, do you have any plans for a future novel? If people like this book, I have other ideas for Charlie and Margaret. I would have them age and put them in other periods of history. So I do have an idea, but I don’t want to be presumptuous and jinx anything. I have to see if people like this one first. I like [fiction], it’s fun. This was a fun project.